Fizz is a wellspring – a cool, bubbling, marketing communications agency that mixes and matches expertise in digital, multicultural, individual and community-level communications. Today, we’re refreshing the fight against diabetes in California’s heavily Latino Central Valley communities, and supercharging the travel and tourism economy, and quality of life, in rural northern California. Let's discuss today what we can do for you tomorrow. TWENTY FIZZ CAPABILITIES: THINGS WE DO (WELL) FOR CLIENTS. We analyze and art direct and brand and buy and code and copywrite and curate and engage and evaluate and position and post and plan and produce and publicize and research and segment and strategize and test and track and transadapt and that's it. Fizz sees it, loves it and helps it. Digital devices and data are in the early stages. As tools for positive change, they now advance each day, every hour. In California, the state with the largest Latino population, nothing can substantively change without Latinos fully on board. At the individual level, change is positive when it comes with social rewards -- the approval and support of close ties. As face time together, in a group, becomes harder to find, each instance becomes potentially more exhilarating and powerful. Salud Sí! Diabetes No! – A new kind of “general market” public health campaign, for a new kind of general market – and public health crisis. In the past, conventional public health campaigns assumed a predominantly White, English-speaking “general market” as the primary target audience, with other ethnicities and languages tacked on as secondary audiences for sometimes limited “multicultural” efforts. But in California’s Central Valley, a new general market has emerged, experiencing a health crisis of jaw-dropping proportions – demanding a rethink of conventional target audience classifications, and strategic innovation in public health communications. Salud Sí! Diabetes No! – Join the Power to Prevent delivers such a rethink and innovation. 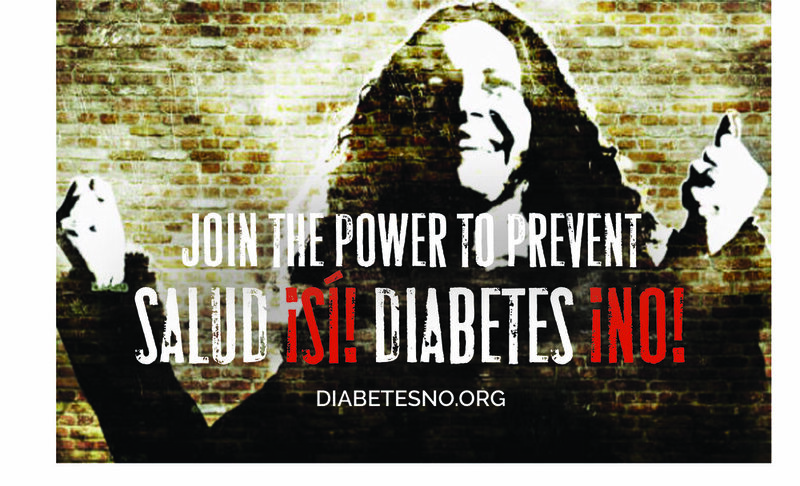 As a campaign promoting diabetesNO.org and community-wide mobilization to improve prevention and care, Salud Sí! Diabetes No! sounds an alarm in ways that break some of the old rules of public health campaign strategy, and begin to write new ones. Salud Sí! Diabetes No! defines the general market in the Central Valley in less traditional, more heterogenous terms than typical health campaigns in other parts of California or the United States. This new general market identity is more Hispanic or Latino than White alone. It is also more bilingual than just English or Spanish dominant, and more apt to combine U.S. and Mexican or Latin American cultures than identify with one over the other. In Tulare County, the initial launch market for the campaign, 65% of the population is Hispanic or Latino. The Salud Sí! Diabetes No! rallying cry, and the diabetesNO.org url, are clear to both English and Spanish-speakers, and equally attuned to each culture’s sense of urgency and commitment to health. This avoids the cultural miscues, idiomatic hiccups, and “lost in translation” problems that can occur when a campaign concept is developed specifically for one language and culture, and then translated or trans-adapted to another language and culture as something of an afterthought. Rather than fragment the power of different language, ethnic and cultural groups through audience segmentation, the Salud Sí! Diabetes No! campaign makes a breakthrough effort to unite them against a common enemy: the scourge of prediabetes and type 2 diabetes that, according to a 2014 UCLA study, afflicts over half the adults in the Central Valley, regardless of race or ethnicity. Salud Sí! Diabetes No! was developed by Fizz working with the Tulare County Public Health Branch as part of California’s Lifetime of Wellness: Communities in Action program. The main feature of the campaign, and its call to action, is the diabetesNO.org website. This site provides online risk testing and local prevention resources and support for individuals who may be at risk for prediabetes or diabetes, and a forum for community healthcare professionals and organizations to share advances in type 2 diabetes prevention, treatment and care. The online risk test at diabetesNO.org was recently demonstrated on-air during a series ofArribe Valle Central morning programs on Univision 21. Additional traffic to diabetesNO.org is being generated by local radio support and a Google AdWords campaign using diabetes-related search terns in English and Spanish. Campaign materials also include banners and logos for community events, such as the recent The Power to Prevent: Tulare County Diabetes Symposium, attended by partner organizations such as Kaweah Delta Hospital Foundation and Health Net Community Solutions. The goal of the Salud Sí! Diabetes No! campaign and diabetesNO.org website is to unite the community, at both the individual and organization level, and for both prevention and treatment. Results will be posted at www.phs-fizz.com in mid-January, 2019. All the features, functionality, content and branding of the diabetesNO.org website can be customized for local prevention and treatment campaigns in any county or municipality, or for any public/private partnership initiative – at modest cost and quick start-up. Contact Lex Matteini, Salud Sí! Diabetes No! campaign director, at lex@phs-fizz.com or (530) 205-5751. You need a Sherpa to climb Mt. Everest, Aconcagua or Kilimanjaro. With Hispanic Marketing, you need Un Guía. Marketing a product or service to Hispanic Market in California and the US has a lot in common with mountain climbing. Scaling high peaks and launching into new markets should both result in significant rewards… but the roads have big risks. It is not enough to have an ice axe, crampons and nylon rope, put on a balaclava and start climbing. The first step is to find a professional guide with expertise in the terrain. With Hispanic Marketing, it is not enough to just take your English campaigns, translate them into Spanish and place the media. You must have a Sherpa, in Spanish un guía, to lead you on the best route. Successful marketing people share certain qualities with great climbers. They have their ego. They tend to be highly confident, sure of themselves, brave and sometimes, impetuous. This type of personality, while having many positives, can also lead to taking unnecessary risks. This takes us back to the guide. When taking on unknown routes, one must have an expert on the local terrain. The great Sir Edmund Hillary relied on his Sherpas to summit Sagarmāthā (in Nepal), also known as Chomolungma (in Tibet), but you probably know it as Everest. But we are not here to talk about mountain climbing. The three names cited here for Mt. Everest illustrate a key marketing point: think and speak in the language and culture of those in the market you want to address. This is true in the Himalayas and in the US and specifically in California. You must partner with a guide that is an expert in the local terrain, down to a specific neighborhood, to introduce you and communicate in language and in culture. Just as an example: in Orange County, sandwiched between Los Angeles and San Diego, there are restaurants specializing in the food and tastes of more than 40 countries from around the globe. It is quite possible that you could go into one of these and find it difficult to select a dish and then ask for it speaking in English or Spanish. You not only need a “translator” for the language barrier, but also a “cultural guide” to lead you through the traditional cuisine of, let’s say Katmandu or Tegucigalpa. Surely everyone in marketing is fully aware of the significance of “multicultural.” Still, many do not give it the central importance it should have. Those of us from Spanish speaking countries have seen the disasters that can befall companies from the US or other parts of the world trying to launch a new product or service. Those marketing egos can suddenly make their appearance, and the gurus think they can use the campaign from their country of origin and simply translate this to Spanish. I remember when I was with McCann-Erikson/Mexico and we were working on the introduction of the Chevy Nova. GM in Detroit international HQ had not stopped to consider meaning of the name of their new compact en español. You see, Nova translates to “Does Not Go”, “no va” in Spanish. This is a two-way street. There are many examples of companies coming from Spanish speaking countries to California or other parts of the USA and thinking they are right at home. They assume (that dangerous word), that if the audience they are targeting is Spanish dependent, they’re just the same as back in México, Colombia, Argentina or Spain. They do not think they need a local expert that understands and can navigate the local idiosyncrasies. It is quite possible that their campaign will get lost in the fog. Sometimes, even sophisticated, successful companies can assume that everything from their country of origin will work in the US. One might ask: did Bimbo, the Mexican global baking leader, consider how the name bimbo might have some negatives with English-speaking housewives? Part of their long-term strategy was to buy Sara Lee, Oroweat and Entenmann’s, among others, and keep Bimbo brand for the U.S. Hispanic market, where it had great acceptance and no negative connotations whatever. A Marketing Sherpa must have instincts that work like ground-penetrating radar to see the route ahead. There are cases when preconceived notions on the part of a company’s marketing team can lead a brand astray. While working on the Hispanic campaign for the iconic Levi’s 501 jeans, I recommended using the great Mexican comedian Mario Moreno “Cantinflas” as the spokesperson. One of his trademarks were his pants, always worn low on his hips and about to fall right off, the way most kids liked to wear in California. The Levi marketing team questioned the use of a comedian that had been dead for many years, aimed at a youth audience. Several rounds of both qualitative and quantitative research showed overwhelming acceptance of the campaign concept. Yet the Levi’s marketing team continued to balk. Finally, at the agency’s cost, we shot TV commercial featuring old movie footage with “Cantinflas” dancing, wearing Levi’s jeans (through the magic of Computer Graphic Imaging) that barely stayed on his hips. We tested this commercial with young Latino Californians and again, the results were off the charts. Kids loved it. But the client cancelled the campaign and the spot never ran. Their reason: it was not as “irreverent” as their General Market (English) commercials were. In other words, we were hired to develop a campaign aimed specifically at the California Hispanic youth market which tested successfully and was then shot down for “not looking like the General Market campaign”, which was of course targeting an audience with a completely different culture and language! In Multicultural Marketing, language and cultural missteps can send your work to the bottom of a crevasse. Many marketers still pay more attention to language a less to culture. Language is certainly a key element of culture. I was the Hispanic Creative Director for the initial Champion’s for Change/Campeonas del Cambio campaign against childhood obesity in California. We had Spanish television and outdoor campaigns that basically transadapted the General Market (English) campaigns. However, it was decided that for radio we needed to completely different executions to better take advantage of this medium. Based on the same strategy, we transcreated our message in a series of musical radio commercials, rewriting the lyrics to famous Mexican Ranchera songs. Recorded by a female Mariachi band, and singing the praises of more fruits and vegetables and the benefits of daily exercise, this campaign not only won prizes, but converts in many other states that asked to re-brand the California campaign for their own Hispanic efforts. The use of “roots” music gave the childhood obesity campaign a true ethnic rhythm. Once again, you must speak in the language and in the culture of the place where you walk. Translating is not the way to go for clear communication and understanding, and much less to build a brand image. Transadapting, the process of going from English to Spanish, and re-writing the copy, is the correct process and keep on the same strategy. However, in cases where there are cultural differences, we transcreate. We reconsider elements of the creative strategy, based on in-language research, and develop a unique creative concept aimed at a Latino audience. It really is not that “foreign.” You are taking the same steps you do in English. But, you don’t want to do this if you don’t fully understand both the language and the culture. So you best get a Sherpa. Or in this case, un guía. FIZZ is a multicultural marketing guide. FIZZ masters language and culture. Ask us. We can guide you on your way. Oh, and back to those egos… It’s okay to take big leaps, but make sure you know how and where you want to land. Andrés "Andy" Sullivan joins Fizz as lead "transadaptor." PHS (aka “fizz”) is pleased to announce English-to-Spanish transadaptation services for public health and other public service outreach aimed at improving the lives of California’s 4.6 million Latinos who are more proficient in Spanish than English. Transadaptation involves amplifying the strategy and theme of an existing, English language campaign by re-contextualizing those elements in the knowledge, beliefs, art, customs – and of course, language – of Latino culture. We like to think of transadaptation as a combination of intuitive anthropology, behavioral science, and creativity that spans a full range of tone and manner. Our lead “transadaptor” is Andrés “Andy” Sullivan, formerly with JWT, Y&R and McCann-Erickson, Mexico City. Andres has worked with PHS co-founders Lex Matteini and Peter Norris on the transadaptation of outreach related to childhood obesity, diabetes, and mental health in California – including Ranchera Spanish radio for the successful Champions for Change campaign to increase fruit and vegetable consumption among Latinos. For more on Andrés click here. For change Movements in the golden state, social media are in, social disobedience is out, and the message takes a backseat to the medium. Is California's brand of activism going soft? Think about all the American casualties in the Vietnam War, add those from the War on Terror, multiply the total by 7, and you would then be approximating the number of children in California -- now alive -- who will die prematurely from smoking. One would assume the state’s anti-smoking movement to be in full swing, demanding change with as much fervor and dissent as any anti-war movement of days past. Yet it appears that Californians are even less engaged in anti-smoking than they are in more mundane matters like what’s on TV today in Sacramento, or where to take the kids on holiday. The modern proxy for actual, real-life involvement in social issues is social media use. The conventional wisdom is that the more likes, posts and tweets an issue gets, the more it manifests “social engagement” and a burgeoning movement. By such a standard, Tobacco Free California, with about 60,000 likes on Facebook, is somewhat less engaging than the capital’s morning TV newscast, Good Day Sacramento, which has more than 90,000 likes, and far less engaging than Legoland California, the Carlsbad theme park with over 240,000 likes. In terms of social engagement, obesity prevention in California fares even worse than tobacco control. Given that 1 in 3 children in the state will develop type 2 diabetes in their lifetime, and other disastrous projections related to obesity, health departments across California launched in 2012 a Rethink Your Drink initiative and would-be movement. These agencies envisioned sweeping change: entire communities fervently rejecting the sugary excess and marketing seductions of “big soda” – and opting for water instead. For all its clinical and anti-corporate wisdom, however, Rethink Your Drink doesn’t really seem to be catching on, online or off. The initiative apparently has two separate pages on Facebook, one with 68 likes to date, and the other suggesting “Be the first person to like this.” Bottled water consumption is increasing, but that’s been the case since the 1990s, long before Rethink Your Drink. In Alameda County, Rethink Your Drink is tied to an annual Soda Free Summer promotion, which has been prominently advertised on buses, BART trains and billboards, and complemented with a special Soda Free Summer Facebook page (facebook.com/sodafreesummer). “With this advertising and social media campaign, we’re hoping we can make people move away from sugary drinks to healthier beverages like water,” the County says in a 2013 press release. At the summerfreesoda.org web site, visitors are encouraged to “spread the word in your community, on Facebook and on Twitter. Become an advocate and encourage soda free policies.” Despite such movement-oriented calls to action, facebook.com/sodafreesummer has just over 2,200 likes to date, and on Twitter, @sodafreesummer has 1,028 followers. The latest Census Bureau estimate of Alameda County’s population is 1,554,720. Where we see drips and drops of engagement on pressing issues in California, they seem in stark contrast to the torrents of support that the state has generated for social causes in past. Fifty years ago, when California became famous for societal change, powerful mandates were conveyed by media as humble as bullhorns, mimeos, and signs draped from colorful, shabbily-converted school buses. We all know the resulting movements – in support of farm workers, peace, free speech, Black Power, the environment, and LGBT rights, to name a few. Back then, what were we doing right that we are not doing, or are doing less of, today? At the 2001 Meeting of the American Sociological Association, Marshall Ganz of Harvard’s Kennedy School of Government proposed that the study of social movements has largely ignored the power of storytelling, and has focused more on “structural matters of resources and opportunity”. Drawing upon his firsthand experience with the United Farm Workers Union, Ganz argues that storytelling uniquely summons the emotional and moral resources needed to form a leadership core, launch an organization, and launch a movement. In 1962, Cesar Chavez and a small group of collaborators completed a house meeting drive among San Joaquin Valley farm workers, soliciting individual stories of injustice and registering 25,000 workers in a call for change. These individual stories were woven into a collective story of injustice tied to the history of Mexican farm workers and the Mexican “revolutionary” tradition. A high point in the movement came when Chavez and his followers marched 300 miles from Delano to Sacramento, where they were greeted by 10,000 supporters – but not by Governor Pat Brown, who had decided to “spend the day with his family” at Frank Sinatra’s house in Palm Springs. The march, the crowd, and the snub by the Governor, all magnified an already dramatic story. Ganz’s argument that a unique source of social movement power is in the new story it tells and explains why today’s tobacco control, obesity prevention, and other good-natured tries at engagement, are just shuffling along. For over 20 years, tobacco control in California has been doggedly re-telling the same story of Big Tobacco’s venal deceit, and it continues to air TV ads featuring the recently-deceased Debi Austin, who first appeared in a tobacco control ad in 1996. That ad, called “Voicebox”, shows Austin speaking ruefully about nicotine addiction as smoke wafts out of a surgical hole in her neck. Debi’s story as a tobacco control activist may be as compelling as that of any activist, anywhere, but it may lack the newness and scope to reawaken dissent and take California’s anti-smoking movement to a new level. As California’s culture bends to the norms imposed by its digital media empire – Apple, Facebook, Flickr, Google, Instagram, Twitter, Yahoo! and YouTube are all based here – local activism may be lured into an over-optimistic reliance on new media. More emphasis might be going into giving people a way to like a story, than a story to like. Californians may also be more likely to use social media as a way to merely flirt with social issues with a like, post, or re-tweet, but without otherwise getting much involved. Proof of the temptation to dabble via social media is provided by journalist Malcolm Gladwell in an October, 2010, New Yorker article, in which he poignantly notes: “The Facebook page of the Save Darfur Coalition has 1,282,339 members, who have donated an average of nine cents apiece.” Similarly, Britain’s The Guardian has advised skepticism about the efficacy of “the social media rah-rah brigade”. From these and other observations, softening activism enabled by the internet is clearly not limited to just California. However, its emergence here is particularly ironic and a bit of a travesty. California’s history of social movements is famous for its “left coast” moxie, dissent, disobedience, volunteerism, creativity, diversity, spontaneity, earnest righteousness … and hard won results. It has been anything but bland and ineffectual. On February 3rd, 1969, the first day of the Santa Barbara Channel oil spill, a dead dolphin washed ashore with its breathing hole clogged, one of thousands of marine animals and sea birds that would perish in that disaster. Energetic college students, shopkeepers, surfers, and parents with their kids, immediately staged a massive beach clean-up – including a Montecito society matron who was seen transporting oily birds in her Mercedes. The grassroots environmental movement that ensued collected 100,000 petitions to ban offshore drilling, founded the first Earth Day, launched the statewide initiative to create the California Coastal Commission, prompted President Nixon to sign the National Environmental Policy Act of 1969 (leading to the establishment of the EPA), and assured passage of the California Environmental Quality Act (CEQA). Other stories of bold, California activism include those of Jack Weinberg, Brian Wilson, and the deceptively tame-sounding Abalone Alliance. Weinberg, of the Berkeley Free Speech Movement, sat under arrest in a police car for 32 hours, surrounded by as many as 3,000 students using the car as a podium for continuous discussion until charges were dropped. Wilson, one of a group of peace activists protesting the Contra wars by blocking the railroad tracks at the Concord Naval Weapons Station, was hit by an oncoming train, suffering a severe skull fracture and ultimately losing both legs below the knee. Between 1977 and 1984, the Abalone Alliance staged multiple occupations at California’s Diablo Canyon Power Plant, with almost 2,000 people arrested during a two-week blockade in 1981 – the largest number arrested at an anti-nuclear protest in the United States. But that was then. Recent social movements of consequence have originated elsewhere – most notably New York, Cairo, and a proposed country called Cascadia. What has made these movements consequential is the new and timely qualities of their message, not of their media. We proudly remain in Liberty Square constituting ourselves as autonomous political beings engaged in non-violent civil disobedience and building solidarity based on mutual respect, acceptance, and love. It is from these reclaimed grounds that we say to all Americans and to the world, Enough! How many crises does it take? We are the 99% and we have moved to reclaim our mortgaged future. These Principles, as stated, validate Ganz’s insight that “social movements are not merely reconfigured networks and redeployed resources. They are new stories of whom their participants hope to become.” Huffington Post reporter Paul Taylor described “We are the 99%” as "arguably the most successful slogan since Hell no, we won't go!" of the Vietnam War era. Writing about the Arab Spring, Jon B. Alterman, director of the Middle East Program at the Center for Strategic & International Studies, suggests that “It is tempting to be swept away by this narrative (in the popular press), which suggests that social media prompted hundreds of thousands, and then millions, of Tunisians and Egyptians to pour into the streets and peacefully demand change.” Closer to the truth, Alterman believes, is that the revolt started in Tunisian hinterlands, a place with very low internet penetration and social media presence, and spread primarily with the help of Tunisian General Trade Union members and TV news reports by al-Jazeera. The initial, catalyzing event that set Tunisian protests in motion was the self-immolation of street vendor Mohamed Bouazizi, in protest of harassment and humiliation he received by municipal officials for vending without a proper license. When Internet activists got involved, they drew just a few hundred of their half-million followers into the street. An initial chant of ‘‘Change, Freedom, Social Justice” was not inspiring, according to Alterman. When the chants shifted to pocketbook issues, however, the protests went from the hundreds to the thousands, and from the thousands they began to constitute a movement. In Egypt, they chanted: ‘‘Hosni, Your Excellency, a hundred pounds for a kilo of meat.’’ Mubarak stepped down after 18 days of demonstrations – succumbing not to the strength of a medium, but of a message. Perhaps the most interesting example of a non-California social movement is one that involves its northernmost counties seceding from California – and the United States – to join Oregon, Washington, and British Columbia in the formation of Cascadia, a proposed independent nation and shared sense of place. The central ideas, messages and story of Cascadia are not new, and in fact trace back to Thomas Jefferson’s vision of a “Republic of the Pacific.” However, in the current era of colossal national failures to democratically steward the economy, environment, and military, the idea of establishing a local, independent, bioregional democracy seems especially beguiling and timely. Regional planners, scholars, and policy-makers have made credible and substantive efforts to advance Cascadia, as reported in recent years by the Seattle Times, New York Times, Wall Street Journal, Time Magazine, Forbes, CNN, and other media. Polls have measured support for Cascadia’s independence at 36% in British Columbia and 42% in Alberta, and have found that 22% of Americans now support a state’s or region’s right to peacefully secede from the union, the highest rate since the American Civil War. While social media certainly play a role in building support for the Cascadia independence movement, Cascadians seem to derive most of their momentum from sequential waves of traditional news media, books (especially Ecotopia), academic papers, documentaries (notably Occupied Cascadia), events, policy forums, and even merchandise (scarves, T-shirts, bumper stickers, etc.) emblazoned with the striking and inspired Cascadia Doug Flag. In additional to all those definitions and reminders of Cascadia’s story and importance, as of this writing the CascadiaNow Facebook has 2,124 likes, and a good article about Cascadia separatism, posted at occupywallst.org and written by @TysonKendall, evoked a dozen comments in its first 2-3 weeks. These numbers are not cited here to suggest social media’s shortcomings in mobilizing movements and driving change, but to help temper the effects of what we are likely to view, retrospectively in the years immediately ahead, as a wee bit of new media hype. There are still places in California, some of them down unmarked roads to remote coastal and mountain villages, where old school, left-coast radicalism is alive and well with all the trappings – genius crackpots, public discourse, mom and pop support, staged events, flare-ups of social disobedience, home-brewed slogans and logos, sympathetic community organizations, impassioned letters to the editor, and a website or two despite what in some areas is still limited availability of broadband. These tightly-knit models of folk activism seem to have been the least bitten by the social media bug, and may be the most likely to reveal the power of message as opposed to medium. Elsewhere in California, where the fusion of technology and communications has created a pervasive sense of social media cool and miracle cure, the temptation must be great to abandon our legacy of radical change, and trade a night in jail or a 300 mile march for a thousand likes online.